M.D., National Defense Medical Center, Taipei, Taiwan, R.O.C. Research fellowship in Aaron Diamond AIDS Research Center, The Rockefeller University, New York, N.Y.
Chief, Section of Infectious Diseases, Department of Medicine, E-Da Hospital (2004-current? 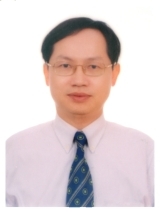 Dr. Lin�s research interest is in the area of genetic characterization and molecular epidemiology of HIV-1 and HCV infection. He is also interested in the field of antiretroviral therapy, antiretroviral drug resistance, pathogenesis, and management of opportunistic infection of HIV-1/AIDS. Dr. Lin�s special interest is in the genetic characterization of diverse human immunodeficiency virus type I (HIV-1) strains in populations. His initial work was conducted among the immigrant population living in New York City. Upon returning to Taiwan he focused his work on HIV-1 and HCV infection among injection drug users. Some of his work have been published or accepted in high impact international journals. His current research concerns the epidemiology of antiretroviral drug resistance among HIV-infected persons in Taiwan. Research award of the Taiwan Society of Infectious Disease, First prize (2005). Research award of the National Science Council, Secondary prize (1990). 3.Lin HH, Huang SP, Hsieh HC, Chen CS, Chen YL. Performance characteristics of the Limulus amebocyte lysate assay and Gas Chromatography-Mass Spectrum analysis of liposaccharides relative to Nitric Oxide production by peritoneal exudates of cells. J Hazard Mater., 145(3):431-6, 2007. 5.Lin HH, Gaschen BK, Collie M, EL-Fishaway M, Chen Z, Korber BT, Beatrice ST and Zhang L. Genetic Characterization of Diverse HIV-1 Strains in an Immigrant Population Living in New York City. J Acquir Immune Defic Syndr., 41(4):399-404, 2006. 6.Lin HH, Huang SP, Teng HC, Ji DD, Chen YS and Chen YL. Presence of the exoU gene of Pseudomonas aeruginosa is correlated with cytotoxicity in MDCK cells but not with colonization in BALB/c mice. J Clin Microbiol., 44(12):4596-4597, 2006. 7.Zhang L, Lewin SR, Markowitz M, Lin HH, Skulsky E., Karanicolas R, He Y, Jin X, Tuttleton S, Vesanen M, Spiegel H, Kost R, Lunzen JV, Stellbrink HJ, Wolinsky S, Borkowsky W, Palumbo P, Kostrikis L, Ho DD. Measuring Recent Thymic Emigrants in Blood of Normal and HIV-1-infected Individuals before and after Effective Therapy. J Exp Med., 190:725-32, 1999.